The 4 in 1 SuperSeat™ offers 360° of floor time feeding and activity fun plus a booster in one! This floor seat includes four unique stages to accommodate younger children while they grow, as a positioner, activity centre, feeding seat and booster. 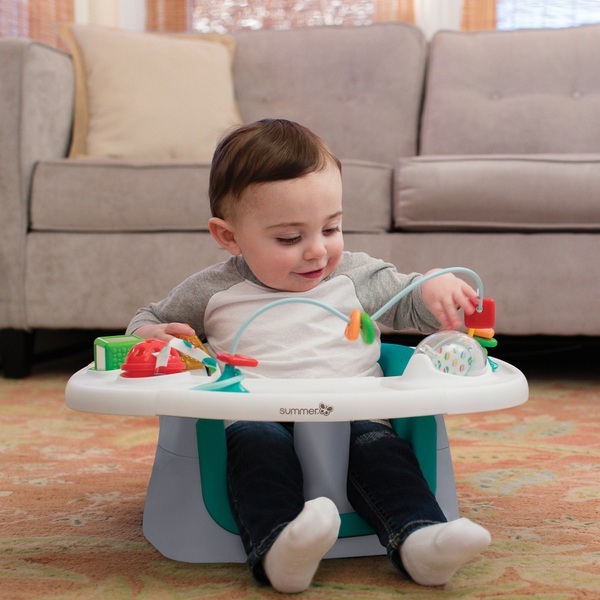 The 4 in 1 SuperSeat™ includes a 3-point safety harness, removable dishwasher safe tray, chair straps to attach it to most dining chairs and multi-sensory toys to stimulate little ones’ hand/eye coordination. Stage 1: Infant Support Seat: Now that your baby is beginning to sit up at around 6 months old, this positioner, equipped with a padded foam support insert, allows him/her to do so safely and comfortably with just the right amount of support. Stage 2: 360° Activity Seat: As your baby begins to take an interest in the world around them, you want to be sure they do so safely. Your little learner can be occupied while playing with the fun assortment of age-appropriate toys on the 360 degree rotating tray. The toys include a shape sorte, track toy with glider beads, lock and key teethers and a spinner ball. Stage 3: Feeding Seat: This product conveniently becomes a feeding seat for your little one. The BPA-free tray can be easily removed to get baby in and out of the seat. Stage 4: Toddler Booster Seat: Once your little one is toddler age, the seat can be used as a booster by attaching it to an adult chair. Now your little one can enjoy mealtime at the table with you.